Replies: 32 (Who? ), Viewed: 31801 times. #1 11th Apr 2012 at 7:04 PM Last edited by simsample : 30th Nov 2012 at 1:08 PM. This tutorial describes how to splice a clean global layer into an existing CAW project; if you wish to splice a layer from another world into an existing CAW project you should use this tutorial. Do not use this method upon a world which is user-populated using this technique unless you want the sims removed. This method will delete any sim populations stored on the global layer. Please see this thread for details. Please be aware that certain world objects can be affected by this method. Please see this post for details. This is a tutorial to describe how to splice a clean global layer into an existing CAW project. You may want to do this if you have an excessive number of objects showing in the global layer; these seem to be error objects that are not needed for the world to function. More detail about that in this thread. Please be sure to backup all files before attempting this. Please be aware that this is an experimental method. Please test all worlds made using this method thoroughly, and report any problems or successes so that we may learn from them. 1) Open CAW. Create a new world of the same height and size as your existing world. So, for my Large 300 high world, I made a new 300 height world. 2) Save your world- Save as> Test.world. 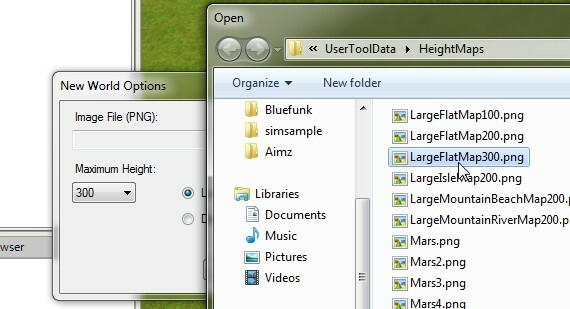 3) Open Documents\Electronic Arts\The Sims 3 Create A World Tool\UserToolData\Worlds\Test\Layers. This folder contains all of the layers for your new world, although this world will only yet have one. 4) There will be a global layer file there, named something like GlobalLayer_b4ba0049cb118ac0.layer. Copy down that hex number- in this case b4ba0049cb118ac0. 5) Copy that global layer file, in this case Documents\Electronic Arts\The Sims 3 Create A World Tool\UserToolData\Worlds\Test\Layers\ GlobalLayer_b4ba0049cb118ac0.layer. 6) Go to your original world layer files. In my case that world was called Jericho and so I went to Documents\Electronic Arts\The Sims 3 Create A World Tool\UserToolData\Worlds\Jericho\Layers. 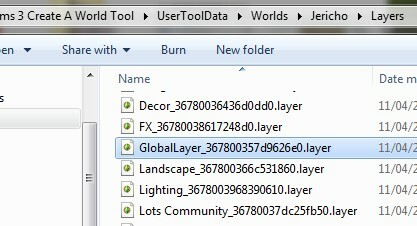 Find the Global layer file, in this case it is called GlobalLayer_367800357d9626e0.layer. Copy down that hex number- in this case 367800357d9626e0. 7) Delete the existing global layer of your original world (GlobalLayer_367800357d9626e0.layer) and paste the one from your test world in there (GlobalLayer_b4ba0049cb118ac0.layer). 8) Now your world has a new global layer, but of course we have to now connect that global layer to the world file. So, open your original world file in S3Pe. In this case I opened Documents\Electronic Arts\The Sims 3 Create A World Tool\UserToolData\Worlds\ Jericho.world. 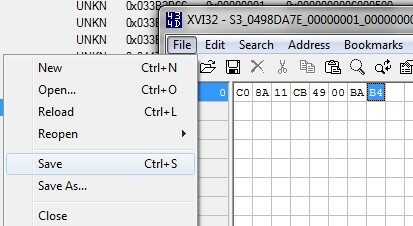 9) Find resource UNKN 0x0498DA7E and right click> open it in your hex editor. I use XVi32 , which I have associated with S3PE (Settings> External Programs> Use an external Hex Editor). 10) Take a look at the figures in that opened resource. Look familiar? That is because it is the same hex figure that you wrote down in step 6. In this case, 367800357d9626e0. However it looks a little different in the hex editor, it displays as E0 26 96 7D 35 00 78 36. 11) You now need to overwrite that figure with the one you wrote down in step 4. So in this case, b4ba0049cb118ac0. However, remember the endianess- I need to type it thus: C0 8A 11 CB 49 00 BA B4. 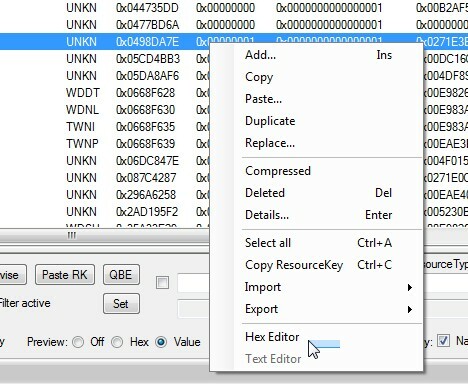 12) Click File> Save and close the hex editor. 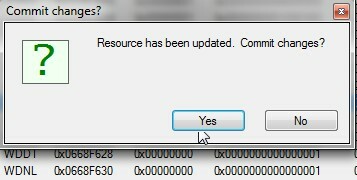 13) A message will pop up warning you that the resource has been updated and would you like to commit. Click Yes. 14)You will now see that you have two copies of the resource UNKN 0x0498DA7E, one is struck out. 15) Click File> Save and close S3Pe. You have now completed the tutorial, and if you open your world in S3PE you will see that the global layer is clean. Be aware that if you add lots in EIG mode or otherwise edit the world, you may incurr objects on the global layer again. For this reason, it may be wise to perform this as a last step in world creation, before export. Please note that it is not clear that this method is necessary; it is perhaps useful if you wish to have a clean global layer, or have stuck objects on the global layer which are troublesome to remove. Please post your questions and findings regarding this method here! I was wondering, wouldn't it be easier to delete the Global layer and then copy/paste an older save files Global layer into the the new one? The beginning worlds layers have the same hex numbers and I find/think can be moved around between the same world save folders. Do you think that would work between Global layers also? Yes, you can copy in a layer from an earlier version of your world- what I've been doing is to keep a fresh copy of my world's global layer when I begin a world, and then just copy it back in whenever I want to refresh it. What this tutorial is doing is explaining how to graft a global layer from another world into your own world, for if you don't have a clean copy available from your own world. Each layer has a hex identifier which is unique to your computer and the name hash- so if you persistently call your layers the same name (trees, lots etc) then there is a chance you may have an identical layer number. However, if the layer does not have an identical hex number, you'll have to associate it correctly, or else the world file won't identify it. #4 27th Jul 2012 at 11:28 AM Last edited by fluttereyes : 27th Jul 2012 at 11:38 AM. Anyway, this object is repeated over and over in the global layer, everything in the global layer points to it. I tried to delete but it says it's on a lot, it can't be on a lot. When I do click on find in render panel the screen goes blue and all i see is this idol thing, I try to pull out to see where it actually is in the world but it doesn't go back to the surface. I have to open the world again to see the surface. The global layer should have 16 characters for the identity- could you perhaps attach the global layer you're trying to replicate? Okay, glad you got it sorted! #8 18th Aug 2012 at 10:51 PM Last edited by fluttereyes : 19th Aug 2012 at 12:51 AM. I have another set of objects I can't delete, this one is a doozy. I have fruit and veg out in the ocean. Bell peppers, melon and maybe a couple of other things, seperate objects as i can move them apart but can't delete as it says they are on a lot. I have no lot in the middle of the sea, there is also no way you can put fruit in a world with CAW, only plants and I have no auto soil plants on the world layer. I'm also still stuck with the knubb thing, over 8000 of them and I have removed all knubb sets from the world, I never had 8000 of them in the world anyway, I had about 20 maximum. It's the fruit and veg that gets me. fluttereyes, try this- backup your world, then import the attached resource into your world file (to replace the existing one). Then, delete the global layer file and replace it with the one attached. what was making it not have enough files? EDIT* Ok I tried and couldn't open the world file after that. I'm wondering if it's because the global layer you gave me has a different number to the one I sent to you? If you import the attached resource into the world file first, then the world should recognise the new global layer. Did you do that bit? Yes I imported with S3PE and chose to replace the file that was already there, I then saved. I then deleted the global layer in my test folder and then cut and pasted your new one into it. I'll try it again just in case I went wrong somewhere. OMG, I take that back. I just tried again and it worked. I think I had used save as last time instead of save. I really appreciate your help, I now have a clean global layer. Thanks so much. Hooray! Well done for making it work, I don't know why you didn't have enough space in your UNKN 0x0498DA7E. Never mind, you have a new one now! Yes, it's always good to know whether it actually works! lol, I haven't exported yet but it's working fine while working in CAW, so if it doesn't do anything much then no worries as it certainly didn't do any hard. I'll feed back as soon as I can get to another export stage. #17 13th Dec 2012 at 7:47 PM Last edited by SommarBlomma : 16th Dec 2012 at 12:10 AM. I had a look into my global layer, and found 247 unknown objects in it. I haven't started building there yet, but placed some rabbitholes to mark the lots I reserved for them. I sometimes used moveobjectson to place these RHs. I also copied the stadium\big show venue from Starlight Shores to my world, so it could have been another source for these strange objects to spawn from. Even though these objects are few, the global layer is larger in size than other layers (though they contain quite many world objects), so, I'm really interested in avoiding that stuff in my world file. And, the last question: does lot placement in EditTown mode in game cause routing problems? I do this in EA worlds sometimes, and once it caused issues in Twinbrook, but usually I don't notice any problems. I had a look into my global layer, and found 247 unknown objects in it. I haven't started building there yet, but placed some rabbitholes to mark the lots I reserved for them. That seems normal, I see objects on the global layer as soon as I place a lot usually. Even though these objects are few, the global layer is larger in size than other layers (though they contain quite many world objects), so, I'm really interested in avoiding that stuff in my world file. Don't be overly worried; we are not really sure what a lot of these objects are or what they do, or even if they are harmful. And, is it true that using cheats like Moveobjects on, ConstrainFloorelevation false, and testingchetsenabled true/buydebug corrupts the world? I've read on Sims3 forums that using these cheats usually makes objects spawn in general layer, anp results in world corruption. Don't believe everything you read on forums! And, the last question: does lot placement in EditTown mode in game cause routing problems? It's best to place the base lots in CAW. Don't sweat about it, that's normal. If you want to remove those objects when you finish your world you can, but it makes little difference to filesize and we don't know if there are any benefits (although the EA worlds have clean global layers). 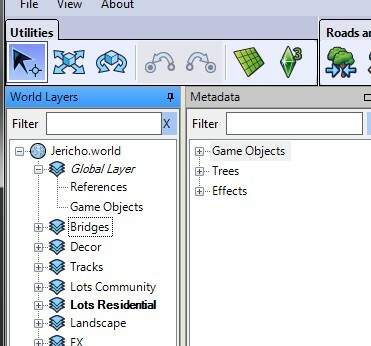 Be sure to leave the global layer though if you are populating your world, or if you have off lot items with information (e.g, dive wells with names). Cleaned the global layer as per directions and it worked fine. Prior to cleaning the Global Layer had approximately 2600 objects. I figured out where these came from: plants. Say you have a plant selected, you've been placing this plant on the terrain and you want to use another plant. If you do not press ESCAPE before selecting a new plant, when you click and make a new plant selection (and didn't press escape first) a copy of that current plant will be placed where ever your mouse was on screen. So every time I selected a new plant I ended up placing a copy of the previous plant somewhere on or even under the terrain. Lesson - press escape, clear any selection you have prior to selecting a new object. The Global Layer after cleaning had zero objects - very clean. Routing was improved a great deal. During a days' cycle I went from 52 vehicles removed to 1 vehicle removed and from around 30 stuck sims to 2 per day cycle - I suspect the ladder are within actual lots themselves. When entering the world in CAW for the first time since clean, the Distant Terrain was missing. Adding this back in, 86 objects were created as a result. A number of these are the common trash, little cornucopia's, you know the trash found with most global layers plus a few invisible objects under the terrain that show no image. Am guessing this is about as clean as it will get. Thanks for the info, PWN9483- there's always been something dodgy about the plant placement in CAW, in old versions of CAW I used to get a pile of plants at co-ordinate 0,0 in my game. Now I know where they are going in the latest version! Having a bit of what I suspect is just a simple rookie mistake, as I'm new to using these programs- I got to step 9 then was prompted with an error pop up "error 2: file not found" when opening the hex editor. I was having this issue with the weatherstone. Sounds like the exact same thing as flutter.....thousands of instances for no reason...showing up in render panel somewhere out in the ocean. Tried moving to another folder to delete but with no luck. I tried this method and it looks like it worked perfectly! YAY!!!! Thank you so much. I am still playtesting the world, so I will need to EIG more and no doubt will have to repeat this process before the world is completed, but at least i know there is a solution. just a note: the only part that kind of threw me was rewriting the hex code...the stuff about endianess is over my head and I am unfamiliar. I was able to figure it out after a bit by looking at the example, but I wonder if actually spelling out how to transpose the code for those of us who are clueless might be a good idea? Just a thought. EDIT: I tested the world that I used this method on by playing it for 2 sim years....2 sets of season changes. There were no issues that I was able to detect regarding performance. Thanks again for posting this. Very helpful! I want to translate this tutorial into Dutch but I can't figure out why the global layer of my test.world only has 15 numbers. I tried several things, with different maps, different names, clean CAW folder in documents, even reinstalled CAW in the standard location (did not help so I installed it back in C:\Games). But nothing. I want to replace the global layer of a world made with the Sunset Valley map. So I used large flat map 300. I have no idea what's going on. Any idea's? Ok, so I tried several things to get a test.world global layer with 16 numbers, like a clean CAW folder and The Sims 3 folder in My documents which didn't work. So I finally decided to re-install everything (maybe there was something wrong in my installation folders). I just had to figure out what the problem was, if there was a problem (I'am not sure about that). I thought if I re-installed everything, there can not be a mistake with the basics. Removed al my sims games + caw with revo uninstaller, run ccleaner and glary utilities, checked the register to be sure and reboot the pc. To make a long story a little bit shorter: it did not change a thing, even when I installed The Sims 3 in the standard install location (so I put it back at C:\Games). My global layers still have 15 numbers, even the Riverview world (so maybe it's normal? ), but not the Sunset world, this has 16 numbers. I asked somebody to make me a test world because she gets 16 numbers. I followed the instructions to the letter with her test world. But when I had replaced the global layer, and linked the right number with the Hex Editor in S3PE, the original world wouldn't open in CAW. So ... I made my own test.world with 15 numbers in the global layer and replaced the global layer of the original world with it. Then I opened my test.world in S3PE, looked for UNKN 0x0498DA7E and opened it with the Hex Editor. The Hex Editor always gives 16 numbers so I copied this number and this number I linked to the global layer of the original world with the Hex Editor in S3PE. It worked! But I have no idea if this is a good idea to do it like this. Somebody? For the purpose of translating the tutorial it will do, for now. I will make a note with it describing my own experience. Before I tried above, I also tried it with the height map of Sunset Valley that Simsample has made available because the original world is made with this map. But of course when I saved this as test.world it also gave 15 numbers in the global layer. I tried to replace this number with the 16 numbers of the test.world that somebody else gave me with the Hex Editor in S3PE and then use the global layer of my (sunset valley) test.world. But it didn't work. Hopefully somebody can benefit from my experience, since I couldn't find any information about global layers with 15 numbers (only Simsample saying this has to be 16 numbers). I think there is a little "mistake" in the tutorial: "and if you open your world in S3PE you will see that the global layer is clean". I think this has to be CAW (that's what I wrote in "my" tutorial). But then again, maybe people who are experienced with S3PE (not me) are able to see this in S3PE as well. I have used this method successfully in the past with no problems - I run error trap in the game once I've installed the exported world, and get no errors (as opposed to numerous errors due to messy global layer). Now, with Island Paradise, if I use this method, my houseboat does not stay connected to the port. I find that I need to enter EIG one more time, reassign the boat to the port, then save and exit. There are only a few objects left in the Global Layer this way. This was done with a fresh sims 3 folder with no mods. I did also encounter some problems with trees/shrubs/flowers disappearing from only the resort (no other lots), but I suspect that may have been mod related, as with no mods, this problem does not repeat. That's good to know. I haven't done this since IP came out. Thanks for letting us know Chuckles.